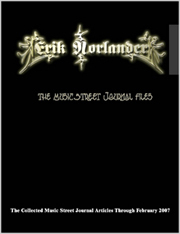 This interview is available in book format (hardcover and paperback) in Music Street Journal: 2008 Volume 5 at lulu.com/strangesound. If you remember, we spoke a couple of years back about you spending some time in Italy. Oh, yeah. That could very well have been the beginning of the whole Italian adventure or “Italian job,” if you like! MSJ: So, why Italy and how did you get the musicians together? I hadn’t been to Italy for many, many years, and David Jackson called me out of the blue and had a spare airline ticket to Lecco, near to Milan, and said, “Look, we haven’t seen each other for quite a while and it’d be great to catch up. Do you fancy going to Italy tomorrow?” I said “yes,” so we went and had a really good time. There was this fantastic festival in Lecco – just south of Lake Como – and I spent two or three days just checking out all the local bands and I was just totally blown away by the quality of two or three bands, in particular. I suddenly had this thought that I really wanted to work with a couple of musicians from two different bands there. So I set about tracking them down through the promoter when I got back to London and, sure enough, I got through to them and they said they were totally up for it, for doing projects. That’s where it really all began so I went back to Italy and met them properly and we did a huge amount of fantastic jamming. It turned out the singer, Francesca Arrigoni, had a really nice rehearsal room right in the middle of Lecco and, also, this great studio where I mixed the live album with a fantastic engineer, Marco Sirico. Sounds like something along the lines of the late ‘60s and early ‘70s musical happenings. It was. It was all really good vibes and great fun and fantastic musicians. It reminded me a bit like the kind of buzz that Liverpool had in the 1960s – a sort of Italian version, if you like. There were all these great musicians everywhere, but in particular the guitar player Franco Giaffreda and the singer I really, really liked a lot. So we set about forming this band and then I had this offer doing quite a big concert in Guastalla so I made sure that it was all professionally filmed and recorded. Then we did some other ones too, later on, with the usual kind of Italian madness of amps not arriving. One of the gigs we did was actually supposed to be in the main square / piazza in Lecco, headlining this festival. Then this torrential rain came down like a tropical rainstorm. Actually, Lecco had the most rain in the whole of Italy, partly something to do with the lake and the mountains surrounding it. It was like 200 days of heavy rain and the rest of the time this really, quite beautiful weather. But someone hadn’t really considered that so on the day of the festival there was literally a foot of water in the square so we had to find – rapidly – an alternative venue. We were driving around in the car with the promoter and we eventually found this theatre that was free. So you managed to avoid the rain? Oh, yeah. We played there, but it meant that all the other support bands gear was on stage and you could hardly move. Once again, it was filmed and recorded on very cheap equipment ‘cause all the great decks and all that had been abandoned because they were waterlogged, and all that. So there were these quite major problems along the way but, in the end, it all turned out really well. Then I went back there quite a lot to mix and I also did a bit of solo recording in the studio there towards a new album. I generally had a really good time there. It was really quite an epic situation and I had no idea, at the beginning, that it would turn out the way it did. Bit by bit it snowballed into a really great situation but because we’d done so much jamming in the studio we really got to know each other musically. It wasn’t like I’d just hired a group of people that I barely knew and they just did the best they could. It became like a proper band situation. So you had a workable chemistry with the musicians. Oh, yeah. That’s what music’s all about and, also, we’d become really good friends. There was a really good vibe. I’d never imagined that I would go to Italy 25 times in the last two years, though the last one was a bit of a celebration because the CD was ready! Prior to that it was really getting onto it. I’m happy to have the “Live In Italy” CD to show for it. Given some of the past questionable events that happened to Van Der Graaf Generator in Italy in the ‘70s, how did you find the live recording atmosphere? Were there any mishaps? There was a technical glitch with the recording at the Guastalla concert – which was really the big one – and there was a recording hard-disc malfunction at the very beginning and the very end so we lost a few very good tracks, a few versions that were very, very good. Still, we got through that. I think it’s very rare for everything to go totally according to plan – especially in Italy! I think those days are in the past but I do know that the band had a horrendous time getting their gear nicked, and all that. I wasn’t actually with them at that point, thankfully. Are you going to use the same musicians in the studio? I might do if I did more out there. I did some keyboardy stuff and a few demos for some new tracks. But I do really want to work in that particular studio ‘cause the engineer’s become a really good friend. I’ve given co-producer credit to him on the album, as he’s a really hot engineer. He did absolute wonders – he’s a bit of a miracle worker! He’s also incredibly generous. I am actually planning to do some masters out there some time soon and we’ll see how it goes from there. MSJ: The adventure in Italy seems to have energized you musically. I’ve really gone into total, dedicated work mode, whereas in the years before that I was writing and doing the odd bit here and there. I’m full on these days, everyday. I don’t take a single day off and it’s morning until night and I’m feeling really good about that - very, very active indeed! Were any of the recorded tracks actually on the Live In Italy CD filmed? Yeah, sure. There are a couple of short things up on YouTube. At Guastalla there was a professional team doing the recording. There were two concerts that were filmed and recorded and some of the tracks from those two concerts… In fact, Live In Italy is made up of 4 tracks from one concert and 4 from the other one. In fact, there was a lot more material. It’s that I opted to do just the CD partly because the number of cameras that were involved – particularly at Guastalla – it really meant a huge amount of sorting out and that kind of editing is not cheap. But a DVD is definitely a possibility in the future! I was actually thinking that, if I did some more concerts – possibly with the same band, or even a different thing here in the UK – and then added that in to create something of interest then it could be something quite grand. You seemed to have bridged the cultural divide. Is there something you could do to bring this closer to the public’s attention, in a cultural sense? Certainly! I’m thinking about the possibility of approaching the Italian Chamber of Commerce in London, to help these Italian musicians become more known outside of Italyd. Generally speaking, Italian musicians do not tour outside of Italy. There are all these groups over there that are huge but you’ve never heard of them. The drummer on the Guastalla concerts is a superstar in his own right. They play only massive stadiums but no one’s ever heard of them in any other country. This is a bit like Japanese bands: absolutely huge inside the country but their music doesn’t export and no one’s ever heard of them outside of Japan. That could be a slight issue because if I did something with the band it would have to be in Italy. Were these guys familiar with Van Der Graaf Generator and your solo work? Yeah. Everyone is in Italy – it’s amazing how big they still are! How difficult was it then to select tracks for a live set? At the concerts it wasn’t strictly Nic Potter and Friends. At Verona we did “Theme 1” but the Van Der Graaf ones… At the Guastalla concert I tried to include my early stuff and then move on to some of my more recent stuff. It made absolute sense, to me, to include 3 VDGG tracks: “Darkness,” “Killer” and “Sphinx In The Face” – I was on the original versions of them. Particularly on those tracks I contributed a lot, so obviously having David Jackson in the band it made absolute sense to do them. Frankly, I think the version of “Sphinx” is well superior to the original recorded Van Der Graaf version. In truth, I feel that I actually should’ve had some sort of writing credit. Everyone knows – I think Guy (Evans) mentioned it in the past – how much I contributed to that album, in particular. But also my bass line on “Darkness” is apparently very recognizable. Despite the no-credit, but in terms of writing, I felt fully justified in doing them. I think we did very good versions, actually. It was obviously a great opportunity having David Jackson there! The version of “Icarus” that fans are used to is the instrumental one with Snowy White’s blistering guitar work all over it. Your new live version has vocals. Did you create the words to the melody line? Yep, exactly! I was really keen to have Francesca in the band as the lead singer, if you like, but most of my stuff is instrumental. Now, that might change in the future, of course. I remember spending a whole day in a hotel room in Lecco trying to come up with lyrics for her and I found it really difficult not having done that before – in fact it was a good exercise for me. I was determined to have her singing so we did come up with some lyrics for “Icarus” but it turned into a totally different version to the one on Dreamworld. What I’ve noticed these days is that a lot of bands, when they play live, it seems to me that they are just re-creating the album version of songs - pretty much sticking to that and not really experimenting. We went totally the other way and a lot of that version of “Icarus” just happened with a nod on stage, just what felt right on the night. At a different concert it was totally different again than the recorded Lecco version. We really, kind of, went for it in the way bands used to experiment, if you like. We were taking risks, as well. We didn’t really have a set arrangement for it so the one on Live In Italy was very much spur-of-the-moment. It just naturally happened. I find that quite exciting, albeit a bit more nerve wracking! I prefer to go that way rather than playing it safe. I understand that you’d recently met up with Snowy White after a Roger Waters show. There seems to be a great example of how the song arrangements have become, if you like, more organic than the rigid versions that Pink Floyd – without Waters – was known for. Yeah. On that note, the concert I saw was at the 02 Arena – which Snowy invited me to, very kindly – was one of the best concerts I have ever seen in my life – no question! It was superb. I was totally blown away. The band was just amazing; all the visuals… I came away from that concert with such respect, not just for the whole band, but Roger Waters. It must’ve been a monumental task to put something like that together - totally incredible. In fact, I went down to see Snowy at hie house a couple of months ago and we spent the day chatting, and the rest of it. His guitar playing just gets better, and better. He’s amazing, absolutely amazing! Any chance he’ll be appearing on your upcoming studio work? Well, it’s become a bit of a tradition now. He’s been on the last 3 – not Live In Italy. I did actually invite him to come and do guitar at the very beginning of the project but he was already booked for Roger Waters. He’s such a nice guy, too! So, hopefully Snowy will be up for doing a track for tradition’s sake. I remember when we did “Icarus.” He didn’t even have a run-through for his long, beautiful solo. He was like, “Just play me the track and hit record,” and it was only one take without having heard the song. Unbelievable, you know! And his guitar really makes that track, as far as I’m concerned. Every time that I’ve ever asked him he’s said, “Yeah, fine – I’d love to. Where and when?” Then he just shows up, does his guitar solo – taking almost no time – and does it beautifully. He’s an unbelievably great guitar player. Apparently he was playing his new Gold Top at the Roger Waters concert, as opposed to his old one. I think Gibson has done a special edition called “Snowy White Gold Top” and they obviously gave him one. It’s basically identical to his old one. I’d like to ask you about your Jeff Beck connection. Could you explain how you got to know him and what happened? Sure. When I decided to leave Van Der Graaf Generator directly after that somehow I connected to Jeff Beck who was looking for a bass player – and that was directly after The Jeff Beck Group with Rod Stewart and Ronnie Wood. What happened was that we were forming a band and I did a couple of months playing with him regularly in different rehearsal studios and at Noel Redding’s house, near to where he lived then at that point in Kent with his 33 cats and model wife, or girlfriend. And I have to say it was mind blowing. There was Cozy Powell on drums and they’d become a real, sort of, duo, me and we were endlessly auditioning singers for this new group. Following this amazing experience of playing/rehearsing with Jeff and Cozy and the endless search for a singer we sort of went our own ways, which was a bit of a shame. I think that he eventually put out Rough and Ready. He played me some of the stuff from that but, frankly, it wasn’t quite my bag. It was getting more technical than the raw, rock stuff. I remember doing "Plynth" and “Ain’t Superstitious” with him, all that great stuff from the Truth and Beck-Ola albums. To me, it was just mind blowing! No, not Phil Chen – the guy on Rough and Ready – I think that was the first album that they did – Clive Chaman and the singer, Bob Tench. Frankly, it was too technical for me. If it goes only a little rock-jazz it’s not my cup of tea, but the raw stuff that we were doing was so great; just instrumental stuff. As a power trio for that couple of months it was unbeatable and he really got the best out of me and I learnt a huge amount from that experience. I wish there’d been some recording of that. I always think that, no matter what stage one’s musical ability is at, if you play with someone who is really, really good it ups your game forever. I feel very privileged to have played with one my favorite guitarists (along with Jimi Hendrix), and probably still is. There is only one Jeff Beck. Sounds like the ‘70s were an exciting time! It was an exciting time for me but the situation was kind of qué cera. It ultimately wasn’t meant at that period in time. It started me off playing with all of these interesting bands like Rare Bird, I did the Chuck Berry album, Beach Boys sessions in Holland – which were never released. This whole stream of things was happening to me that was an incredible musical education. All the time I was doing these interesting projects with very well known people. One couldn’t have dreamed that that would be how it would work out. Then, of course, later in the ‘70s I got back together with Van Der Graaf and that was amazing. After that I did a lot of stuff with Peter Hammill, K Group I thought was a really great band and it was a shame that came to an end. That was like the rock version of Van Der Graaf to me. Going back to the ‘60s, you were actually in a class with Free guitarist, Paul Kossoff, at school. Do you have any recollections about him that might offer clues to the Koss enigma? Yeah, he was an old school friend, same class as me. He got expelled from my school in North London! He was a very good friend of mine and he introduced me to the blues and was a great guitarist, even then. I remember him playing classical guitar superbly. I think he was in a band called “Black Cat Bones” for a bit. I didn’t see him for a while after school but then re-connected with him when he was in Free – I saw a lot of him then. He used to come around to my flat in Earls Court – where Jeff Beck used to stay occasionally – and we became very good friends again. Then there were a couple of years when we weren’t in contact. I think that was post-Free and he had been rehearsing in a rehearsal studio and heard a tape of this thing from a jam that I had, and he called me up and said, “Look, I’ve heard this tape of your bass playing and I really like your bass playing. Do you fancy joining my band?” I said, “Paul, it’s Nic Potter! I can’t believe it, what an amazing coincidence!” He hadn’t realized it was me. I think the studio said that it was some guy named Nic and that they had a phone number. So, suddenly, I was rehearsing with Paul Kossoff! But it never went further than hours and hours of rehearsals. Mick Kelly from Spooky Tooth was on drums. Quite frankly, I was very close to Paul but, by that time, he was unfortunately not in good health. His guitar playing was great – very powerful – and it was amazing playing with him but he obviously had problems. And, of course, I was absolutely devastated when he passed away; Free were an amazing band. They were, indeed. Such a pity that the fire burnt so brightly for such a short time. True. That whole vibe had so much to do with my Earls Court flat: I remember we had this grand piano that had come with the flat, like fixtures and fittings. Anyway, we sold the piano to Andy Fraser to take out the window, which he probably wrote quite a lot of the Free stuff on, I would imagine. Now, Paul Rodgers I already knew because when I went, very briefly after leaving school at 15, to college Paul Rodgers was in the same class! So I knew him quite well individually apart from the others. There were a lot of funny little coincidences around all that but, Paul Kossoff, I miss him. Very little! (laughs) I heard the new Coldplay CD in Italy and I like a couple of tracks from that very much. Quite frankly, I tend not to listen to too much music, apart from the odd blast every now and then. I take everything out and play them at top volume, have a few beers and just go through all my favorite albums. But then I won’t listen to anything for a while. The reason is that I find if I listen too much to other music, it starts going round in my head and, instead of being able to concentrate on my own material in the music department in my brain, suddenly I’ve got someone else’s tune in my head. Like the Coldplay CD – I wish I’d never heard it now, it’s quite addictive! Music doesn’t seem to affect other people that I know like that. Particularly at the moment because I’ve been writing so much material I’m a bit cautious. It’s different at live concerts because they’re like a one-off thing but I’m a bit cautious at the moment. On the other hand – having said that – I might have a massive blast of that all in one go! Could I ask what you’ve been listening to? I got a CD in the mail by some guy named Nic Potter, called “Live In Italy”. It’s not bad. You should check it out! Seriously though, your CD hasn’t left my player in the last two weeks. Oh, fantastic. I’m flattered and honored. Marvelous! It’s really heart warming to get positive feedback from people. I have to admit that the response that I have been getting has been amazing. In the early stages of mixing it I played it a lot but I haven’t really played it recently. I’ll probably put it on some time again soon, just to check it out. I’m always like that. I remember what it was like with the early Van Der Graaf albums: I’d initially play them and then it’d be like, “Oh, I’ve played them 50 times!” and put them away. Years later I’d come back and think, “Oh, actually not too bad.” I’m not exactly at that point with Live In Italy but… I might actually bung it on a bit later on. You can tell that there has been an incredible amount of effort, not only in the production, but the actual performances. It sounds like great chemistry at work. Oh, definitely. But each time I go back to Italy I get, “Nic, when are you going to learn some Italian?” I’m hopeless! Anyone else who’d had that many trips would be speaking the lingo. I’m still like, “Grazi! Uno Cappucino…” totally hopeless. On the other hand, they generally speak a bit of English, although Franco the guitarist doesn’t but it doesn’t matter because the common language really is the music. So, music has transcended that barrier. Oh, yeah. So there’s never any problems with the actual music. With the buzz surrounding your new live CD, is there likely to be a re-release of the limited Blue Zone Party live album or a compilation of other live material through the years? It’s definitely something I’ve been thinking about. Are you still using that same Fender Precision bass that you used when we last jammed together? I’m still using the ’65 Fender Precision, ocean-turquoise. I think I was using the black one when we were doing that duo jam, if you recall. I’ve got 3 Precisions. The really choice one that I play is the ocean-turquoise bass, custom color. I don’t take it out very often ‘cause it’s like a museum piece but I used that on the Guastalla concert. I also have a 1952 Precision, serial number #0254. It’s a superb guitar that I bought in California from a Recycler magazine in 1980. It had been picked up in the desert and it had warped the scratch plate and had some re-finishing on the body but otherwise it was in great condition - beautiful neck, fantastic sound. It was actually advertised as a Telecaster Bass, which weren’t actually made until the ‘70s. I had a funny feeling about it and told them that I would definitely buy it and they wanted $500 for it that, at that time, was about 200 pounds. I snapped it up, brought it back to England and took it to a shop and they told me that it was one of the early ones, something like the first 2 or 3 months of production. The bass that I often use that is really reliable is a Japanese black Precision, maple neck that I’ve had for years. I bought it in Denmark Street in London. It actually did a lot of the Pete Hammill stuff. It was always reliable but the thing about that bass is that if it fell over it didn’t matter. It never goes out of tune and it’s got a pretty good sound. I’ve got 3 Precisions but I’m on the lookout for a Gibson Grabber that I used to have in the 1970s, when they first came out. They’re a really nice bass and they do come up on Ebay from time to time. Generally, I’m a Fender Precision man but I am quite keen to get a Fender Jazz Bass if I can find a nice one. I’m sure you know, these days vintage guitar prices have gone through the roof. What would you say would be your biggest Spinal Tap moment through all the years of touring and playing with all of these famous faces? Could I get back to you on that one? I can’t think of one off the top of my head but there’s bound to be quite a few, actually. One incident does come to mind. My biggest Spinal Tap moment was doing a TV show in Hamburg, Germany with The Manic Street Preachers. It was a concert and we were on the same bill – I was with Peter Hammill. They were on first and that guy who went missing, Ritchie, was in the band then. It was loaded with record company people and the band trashed their equipment. As we went on – at exactly the same moment – both Peter’s guitar strap and my strap broke. It was unbelievable, just after we got on stage. And both our guitars fell on the floor – on TV! Peter was very quick off the mark and immediately went up to the microphone and said, “At least we trash our gear before we’ve start playing!” and there was this huge roar from the audience. Unless it was edited out, it’s bound to be on German TV. It might have been edited out but it should really be on YouTube. It was pretty damn funny!